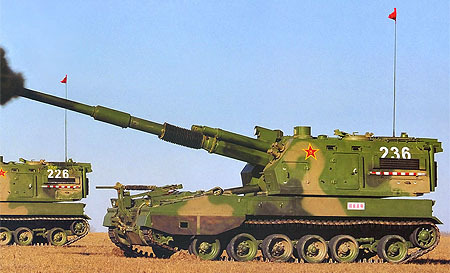 The Chinese PLZ05 Self Propelled Gun is an improved PLZ-45, principally the up-grade to a calibre Length 52 main cannon. Its unclear if the vehicle has a fully automatic loading system, as the PLA were not impressed with the semi automatic loading system on the PLZ-45, which has resulted in a enlarged turret. The tracked hull is also different. The PLZ05 six road wheels are set with 5 forward, then a gap between them and the final sixth rear wheel. The PLZ-45 has 4 set at the rear with a gap between not only the forth and fifth, but the fifth and front sixth. The first prototype was completed in 2003, making its first public appearance in 2005. It entered service in 2007 with the PLA and at least one PLZ05-equipped battalion is now serving with the artillery brigade of the 39th Group Army in the Shenyang Military Region. Not much more is known about the vehicle.